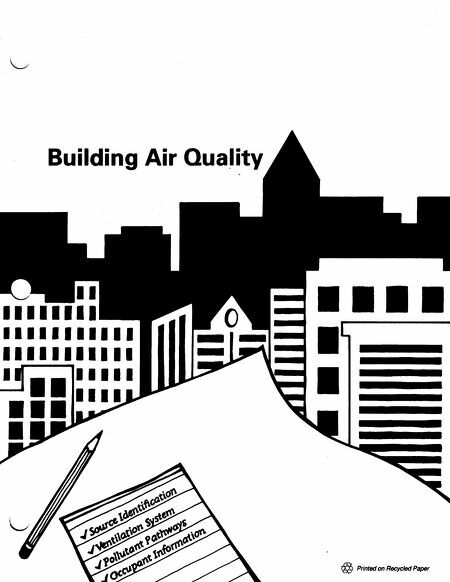 Developing an IAQ Profile 19 After reading this manual to develop a feel for the issues involved in maintaining good indoor air quality in a building, the development of an IAQ profile should become a priority. The process of developing an IAQ profile should require only a modest effort, from a few days to a few weeks of staff time, depending on the complexity of your building and the amount of detailed information collected. The work can be done in pieces over a longer period, if necessary, to fit into a building manager's busy schedule. Over time, it is desirable to make some actual measurements of airflow, tempera- ture, relative humidity, carbon dioxide (CO 2 ), and/or pressure differentials (e.g., in each of the air handling zones or other sub- areas of the building). These measure- ments provide far better information on current conditions than can be obtained from the plans and specifications, even if as-built records are available. In addition, few buildings have been adequately commissioned, so the system may never have delivered the airflows shown on the design drawings. In the event of litigation around future IAQ complaints, the value of the IAQ profile as a resource document will be enhanced by real-world measurements. (Refer to Appendix G and the ASHRAE standard on commissioning. The EPA document on designing for good indoor air quality, which is due to be published in 1992, will contain a more complete discussion of the process of commissioning buildings.) 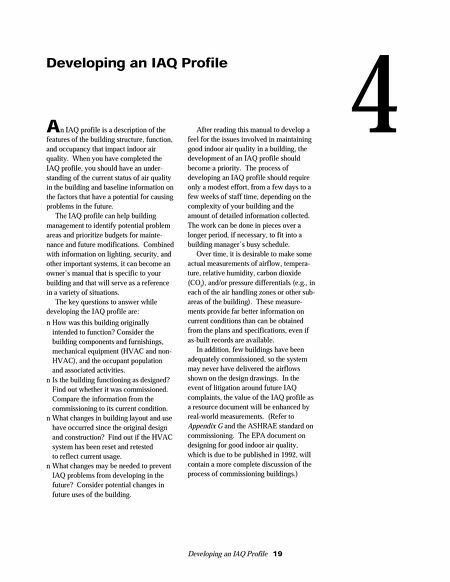 4 Developing an IAQ Profile An IAQ profile is a description of the features of the building structure, function, and occupancy that impact indoor air quality. When you have completed the IAQ profile, you should have an under- standing of the current status of air quality in the building and baseline information on the factors that have a potential for causing problems in the future. The IAQ profile can help building management to identify potential problem areas and prioritize budgets for mainte- nance and future modifications. Combined with information on lighting, security, and other important systems, it can become an owner's manual that is specific to your building and that will serve as a reference in a variety of situations. The key questions to answer while developing the IAQ profile are: ■ How was this building originally intended to function? Consider the building components and furnishings, mechanical equipment (HVAC and non- HVAC), and the occupant population and associated activities. ■ Is the building functioning as designed? Find out whether it was commissioned. Compare the information from the commissioning to its current condition. ■ What changes in building layout and use have occurred since the original design and construction? Find out if the HVAC system has been reset and retested to reflect current usage. ■ What changes may be needed to prevent IAQ problems from developing in the future? Consider potential changes in future uses of the building.